I believe the vehicle is rear engined and was the first rear engine PCV class. I thought they were AEC rather than Leyland but would not wager any money on it. The styling is Q related I think and was the Q single decker the first inclined mid-engined PCV? I’ve been waiting for one of these to come up, here is a shot for the other side. Sorry, Roger. Definitely a Leyland. Perhaps even AEC weren’t brave enough! What was the gear selection system on these vehicles. Were they manual or semi-automatic. Also, were they one-man operated or crew. Two very interesting photos. I cadged a brief ride that day at Longcross and I’m sure that the gearbox was a conventional 4-speed. The engine (indirect injection) sounded remarkably like a Perkins P4, with that characteristic combustion tinkle, and it has the same bore and stroke. The rear hubs fooled me: I guessed they must be double-reduction, but apparently they house universal joints at the outer end of each cardan shaft, as the axle is arranged on the de Dion principle, which doesn’t give independent suspension but does cut down unsprung weight by mounting the differential either on the chassis or in unit with the gearbox. In the late forties on a visit to my aunt and uncle’s at Ealing, Mx, somewhere near Brentford(?) from the window of another bus I saw one of these vehicles, which looked very strange—even slightly creepy—to my 8-or-9-year old eyes. Fine restoration job, and thanks to the owners for saving another rare bus, full of innovation and individuality. Ian is correct in his description of the CR, which was built at Leyland’s Kingston factory (actually in Ham) which had once produced Sopwith aircraft. The six cylinder indirect injection engine, which had been developed for the later production Cub KPO3, had a capacity of 4.7 litres developing 65 bhp, and it was mounted longitudinally at the rear of the chassis frame. The radiator was also located at the rear. The engine cover inside the vehicle was equipped as a luggage rack. The gearbox was the standard Leyland four speed “silent third” – sliding mesh 1st and 2nd, helical 3rd. Given the limitations conferred upon the passenger capacity of this small vehicle by the engine layout, it was particularly galling for the LPTB to have to adopt a space wasteful front end design similar to that of the contemporary underfloor engined TF (Tiger Flat) Green Line coach model. Had the doorway been located in the logical position ahead of the front axle (as was the 5Q5 version of the AEC Q) then the Metropolitan Police would have insisted upon an open, doorless entrance. It is often stated that the production of the CR was curtailed by the outbreak of war, but this is not the case. Always prone to over ordering, the LPTB originally decided that it required 73 examples in addition to the prototype. Having redone the sums, this was cut to 58, and then to 48. All, except the 1937 prototype, were delivered after the start of the war, the last arriving in December 1939. Many of them saw service in the first year or so of the war, but then went into storage in 1942. Several went into storage in 1939 from new. 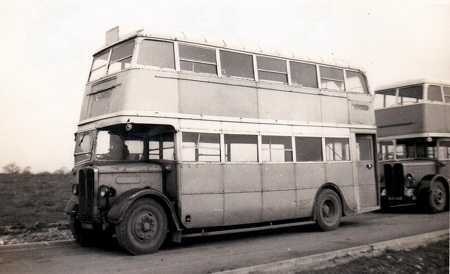 They began to reappear in 1946 when their original function had largely been usurped by larger buses. Instead they were employed on Central Area routes with conductors to meet the pressures of post war demand, and proved woefully unequal to the task. Breakdowns were frequent and spares in short supply. By the early 1950s they had all gone. Another bus spotters’ delight…….and operators’ nightmare! Thx for your usual detailed information, Roger, especially the gearbox information which I’ve always wondered about and which even the London Bus Museum website doesn’t explain. Although Merton Garage had the odd one allocated to it (Sutton didn’t, to my knowledge), I never saw one around my area at all. The Town & Country Act of 1947 rather ‘did’ for expansion of London (and other cities), where unbridled ‘ribbon’ development stopped, handicapped, in any case, by a lack of building materials. The ‘Northern Heights’ extension of the Tube’s Northern Line, plus some other Tube bits and pieces, were never completed and the CR’s intended feeder services never expanded. 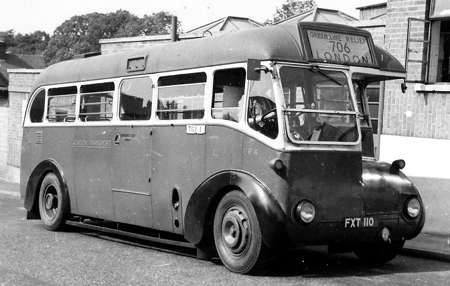 According to the Ian’s Bus Stop website, Merton (AL) did get at least 4 CRs in 1946/7 – including one in green livery – mainly for route 88, and Sutton (A) at least two for the 213 and latterly 93. The 1 1/2 deck Leyland Cubs designed for the ‘inter station’ route and a number of single deck buses (including some pre-war Green Line coaches) also saw central bus service (on routes with a double deck allocation) around this time. All were crew operated – the OMO agreement for central buses had by then lapsed, and the practical (and industrial relations) complications of having one or two OMO buses on a crew route would have been a bit too much to handle. Operationally, I understand that the single deckers only ran on ‘spreadover’ workings (i.e. peak hours only) and I would have thought that if any garage had more buses than crews on any day, the single deckers would have been left in the garage. Hired in coaches followed in 1947, and new Bristol Ks diverted from ‘Tillings’ companies followed in 1948. Correction to my earlier comment! What I glimpsed at Brentford (?) all those years ago was probably not a CR but a TF, whose existence I’d forgotten all about until reading Roger’s reference to it. I recall the mystery bus as being of normal length. As I know practically nothing of what LPTB buses ran on which routes, perhaps someone—Chris H, perhaps—could say whether TFs did or didn’t go through Brentford. The combination of 8.6-litre Leyland engine and epicyclic gearbox in the TF must have made for a very tuneful ride. CR’s and TF’s did have a generic likeness, Ian, and green CR’s did run in Central services and vice versa at times, adding to the confusion. The TF’s ran the Green Line services and you will be interested in that the 701 ran from Gravesend to Ascot, passing through Brentford, from 1946 to 1975, as did the 702 from Gravesend to Sunningdale from 1946 to 1973. I did travel on a few TF’s and they did exude an aura of understated luxury. Thanks, Chris H, for confirmation that TF passed through Brentford. The vehicle through whose window I snatched that one childhood sighting will have been a trolleybus on the 655 route. Incidentally, my only LT ride (on the long back seat for 5 upstairs where you can look down onto the staircase) was with the same Ealing aunt, and I’m sure the bus said “Hammersmith” on the destination box. Chiming gearbox and snuffly petrol engine that seemed to backfire occasionally; six wheels; straight staircase; what more could any bus-mad kid wish for? Up to what date could that have been? Thanks in advance for any info. Apart from the last scheduled allocations, a number were spread around garages to supplement the scheduled allocation until late 1949. Hammersmith (Riverside) garage had a fairly substantial allocation of LTs on routes 11 and 17 (London Bridge – Shepherds Bush – no relation to the later north London incarnations of the route number) and 73 until 1949. Mortlake’s routes 9 and 73 had LTs until 1948 and 1949 respectively (some at Mortlake were initially replaced by green RTs as deliveries had got out of step with needs). Thanks, Jon and Chris H, for the information on LT routes and dates. Very nearly having my school cap blown off on the stairs of open-staircase Titan Reading 36 (RD 777) seemed exciting at the time, but that hardly compares with Chris’s extraordinary rescue! Thanks also for the Bluebird link. LT741 is a very rationally-designed and handsome vehicle, and the superb interior shots answered all sorts of questions. Pity that no Bluebirds survived, but we can say that of a host of fascinating vehicles that live on only in tantalising photographs. Here is a picture of CR 14, FXT 120, taken at South Croydon during the HCVC rally in May 1972. 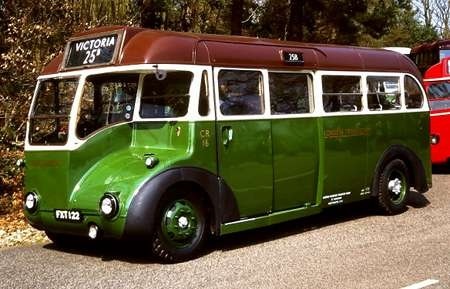 This bus was delivered in 1939 and went into service in Country Area Green livery at Windsor garage before being withdrawn into store along with the rest of the class by 1942. In 1947 it was overhauled and repainted into Central Area red livery, though the purpose of this expensive exercise appears somewhat elusive as it was only used by Chiswick as a training vehicle during 1948. Just one year later, in 1949, with characteristic profligacy, London Transport then repainted the bus back into Country green for service on rural route 494 between East Grinstead and Oxted via Tandridge, Lingfield and Felcourt, a route that then became a Guy GS operation after the the surviving members of the CR class were withdrawn entirely in 1953. CR14 was selected as an exhibit for the LT Clapham Museum, but, in 1967, it was sold off into private preservation. Although in the photo the vehicle is shown with route 12 destination blinds, the probability of a CR being used on that very busy route must have been remote in the extreme. 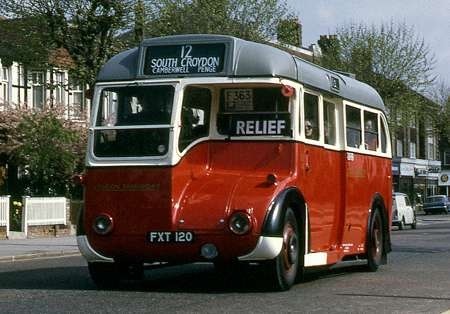 However, it does seem that some examples of the class may have been used occasionally in the Croydon area for Relief duties on route 68 (South Croydon – Chalk Farm). I can confirm that red CR buses were indeed used on the 68 route. I used to often see “two of them” (numbers unknown) parked at Beulah Hill, junction with Spa Hill (Norwood) on my way to secondary school. I’ve no idea why there was need for two of them. My intelligent guess is that this would have been in the late 40s or very early 50s. 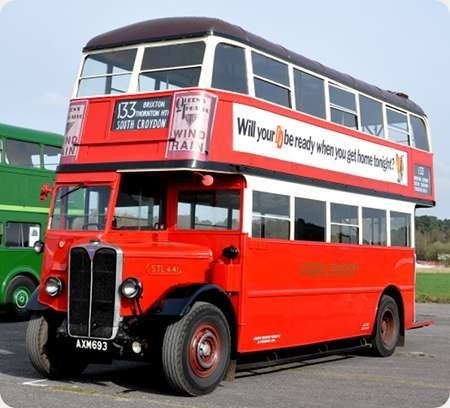 Among the first rear engined buses were the SOS REC type built by The Birmingham & Midland Motor Omnibus Company, better known as Midland Red in 1935. The company didn’t find them successful and rebuilt them with underfloor engines. Since the CR vehicles were based on the Leyland REC chassis, Ian, was there any connexion between the SOS REC’s and Leyland’s, or was it merely a coincidence of titling? Could someone come up with more information on BMMO’s SOS REC’s? There were four of them fitted with transverse mounted petrol engines so I think only the name was the same. AXM 693 is an AEC Regent (Regent I in some listings but not in all of them) from 1934, new to London Transport with fleet number STL441. Her LPTB body has H56R seating layout and she now resides at Brooklands, following the relocation of the collection from Cobham. We see her during the gathering at Wisley Airfield on 11 April 2010. Originally this bus would have been marketed simply as the AEC Regent – no one would have bothered to state ‘Regent I’ until after the improved Regent II had appeared. The same thing happens with monarchs – Charles I was never known as Charles I in his lifetime. This batch of early STLs had Daimler preselective gearboxes from new, but their petrol engines were replaced with 7.7 diesels just before the outbreak of WW2. I lived in the Croydon area up to the age of four in 1946 (and then again from 1952, though by then the STL was a rarer beast). I remember travelling around south London on buses of this type, and didn’t much like them because of the high level of the lower saloon windows that seriously impeded the outward view of a small boy. In my firmly held opinion of that time, the Chiswick designers had got their priorities all wrong, though I conceded that my services wouldn’t have been available as a consultant when they were built in 1934. Thank you for your thoughts about the "order of succession" David. I had guessed that to be the case here, and – one has to suppose – with that wonderful range of products from the Dennis Brothers. Morden, then in Surrey, was my stomping ground in the 40’s and 50’s, full of utility ‘D’s and pre-war RT’s. STL’s only appeared on the 118 from Clapham (then) to Raynes Park. I did have two aunts who lived in Norbury and my mum and I would trundle round there, which made a pleasant change from the usual bus types. I agree about the lower deck windows, but usually persuaded my mum to go upstairs, despite the ‘fug’! Many of these early ‘non-rounded front’ STL’s were overhauled and put back into service with full blinds, briefly, when the last tram conversion was brought forward and merged with the penultimate conversion stage, in 1952. And very smart they looked, too! They were the only STL’s to acquire full blinds post-war. I think it was done to provide passengers with the fullest information on the tram-replacement routes, which didn’t usually coincide exactly with the tram ones and had different route numbers, too. The excellent ‘Ian’s Bus Stop’ website states that STL441 formed one of fifty ‘leaning back’ STL’s which were delivered in 6/34 without engines, then fitted with ‘hand-me-down’ petrol ones from the LT class vehicles, which were being converted to diesel power. AEC’s diesels were, at that time, too big to fit into the STL’s, hence the swap-over. It had a Wilson pre-selector gearbox and was either fitted with a fluid flywheel at that time, or retro-fitted with one in the October. It eventually got its 7.7litre diesel engine in 5/39. Mann Egerton rebuilt its body in 12/47 and it was withdrawn in 9/52. It was sold, in 2/53, for preservation in Holland. It was repatriated from the preservers in 1975 by LBPG and stored at Cobham, being fully restored in 2007. It still bears the wartime ‘scar’ of a two-piece platform rear window, which most LT buses bore, to make the glass, in time of shortage, go further. All-in-all, an interesting life. I am also a Dennis fan, Pete. A company that deserved greater success but which could also be slow to innovate, which is why it lost the single deck market once underfloor engines became the standard. The Loline was a terrific bus, especially in Aldershot & District livery and specification. Returning to the point and looking again at the STL, this particular vehicle almost had a provincial (with a small ‘p’) outline. This bus featured in an episode of Goodnight Sweetheart. which is what led to me googling it which brought me to this site. I am coming to the end of my boyhood ex-London Transport (photographed) sightings now. I proffer this shot of ex-London Transports STL 2117 during the building of Stevenage New Town, when Mowlem Construction hired their workers’ transport from Progressive Motor Coaches of Cambridge. STL 2117 was seen in the company of STL 971 on April 8th 1958, awaiting its next muddy-booted cargo. I also managed to get an old tax disc from STL 2117 for 1957 showing a yearly charge of 86 pounds 8 shillings. As a kid, I always thought works buses looked drab and neglected. 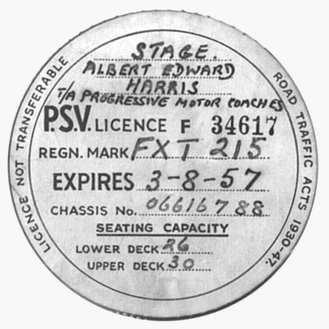 In retrospect, knowing how many fine vehicles were scrapped at the end of their PSV lives, I suppose this did extend their lives. How many subsequently survived into preservation, though? Not to mention those who survived as showmen’s vehicles in many guises and often ingeniously (sometimes very professionally) modified. It was more interesting for me to look at these than partake of the amusements/rides – how sad is that? At least these vehicles survived longer than worn-out, hard-worked, often-abused works buses. 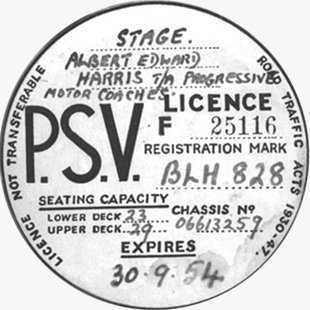 Progressive Motor Coaches was formed in 1934 by Albert Edward "Paddy" Harris who had previously worked for Lord Astor Coaches (which, despite its high sounding title, was run by a family named Brown). The Progressive livery was pale green and white. As Victor’s picture shows, this operator had two STLs, Nos. 971 with Chiswick H29/19F body (ex Country area) and 2117 with a later Chiswick H30/26R body (like the others in this batch, its original metal framed Park Royal body had proved to be a disaster). These two were bought in 1955, and were kept until at least 1958. Progressive also had a total of five so called "pre war" RTs (in fact, all except RT 1 entered LPTB service between 1940 and 1942). These were RTs 32/40/76/84/139 FXT207/215/251/259/314, all of which were bought between January and April 1956. RT 32 was sold on almost immediately, RTs 76 & 84 lasted beyond 1958, and RTs 40 and 139 were disposed of in 1959. I owe much of this information to Ian’s Bus Stop website, and to Paul Carter’s detailed books on Cambridge in the Prestige Series. 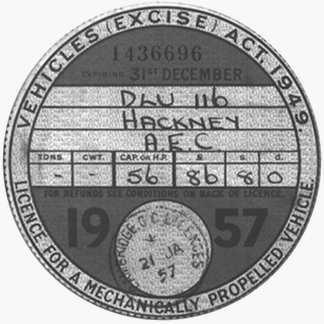 Thanks for the information Roger guess what was on the same scan of the DLU 116 tax disc. There is also BLH 828 if anyone knows more on that Regent 06613259 I will post it. According to Ians Bus Stop, BLH 828 was STL971, mentioned above. Peter, BLH 828 was the registration of STL 971. This was one of the Country Area green STLs which had a Chiswick built body of the peculiar front entrance design which seated only 48 passengers, 29 upstairs and 19 downstairs. This design had no entrance door, it being supposed that the angled front bulkhead would prevent draughts from entering the saloon. Of course this theory was preposterous, and these buses were notoriously cold to travel in. (I can confirm this from my own childhood recollections of these things on the Chelsham operated routes across Croydon.) Progressive upseated BLH 828 to 52 by adding four seats downstairs over the wheel arches. Roger Cox beat me to it with details from Paul Carter’s excellent books so I will just add that my memories of International Progressive Coaches (as they became) are from the 1960s when their modern coaches (half a dozen brand new every year) passed my home. Sadly it all went pear shaped in the early 1970s and by 1974 the business was finished. Nigel you say "International Progressive Coaches (as they became)" do you know when the name changed, I do have a good reason for asking. Unfortunately Paul Carter’s book doesn’t say exactly when the name changed but it implies that it was between 1964 and 1969. However it seems that at least some of the coaches kept the old fleet name after this time. Continental trips had started soon after WWII. Thanks for that Nigel that is near enough for me, you will see my reason for the question Friday 03/02. I have every registration mark of the fleet from day one.